Oh boy! December 9 is national brownie day. That's right, it's yet another "national" (as in fake) food holiday. Greystone Bakery was celebrating with a 30% off sale, so I decided to do a little celebrating myself by heading to the grocery store to find something appropriate. 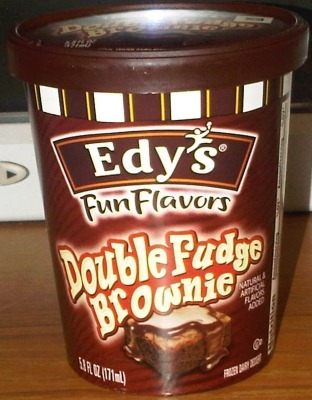 The most practical solution I found was a snack cup of Edy's ( Dreyer's ) Double Fudge Brownie Fun Flavor. Remember, "fun flavor" = frozen dairy dessert = not actually ice cream. Ok, I'm hungry, so let's get started! Wow, it's actually filled to the tippety top, looks pretty airy though. Wow, running into lots of chunks right off the bat. They are about the size of peas. They don't seem to have a ton of flavor, but their size isn't helping that. I tried to eat a few at a time, but I'm still not getting hit with much flavor. There's the usual Edy's chewy funk. I was having a debate with a coworker the other day. He doesn't like Breyers because it's gritty, but he does like Edy's because it's creamy (as you know, I prefer all natural Breyers to this funky Edy's, though maybe he was talking about Edy's grand and not a fun flavor). The chocolate flavor is ok, I think it's the texture that goes with it that really throws me off. I was really in the mood for chocolate when I started too. Maybe I psyched myself up too much. 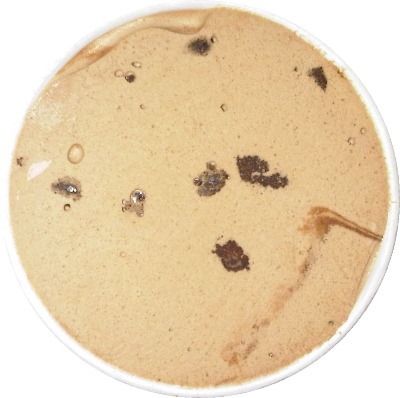 It's just a typical low cal chocolate brownie treat that doesn't satisfy like ice cream nor does it really taste like brownies. The swirl comes and goes, but it's thin and doesn't add much except color. Yeah, this just isn't working for me. I'm trying to go slowly to enjoy the chocolate, but then the brownie bits feel gummy in my mouth. You know what? It's starting to melt and it reminds me of chocolate mousse. Shove this stuff in a crunchy chocolate graham pie crust and maybe I'd be excited. Hmmm, maybe that's how they should market it: "Watch it melt into a pile of mousse!" And it's over. I can't say I want anymore. That soft mousse-y texture just didn't work for me. Oh well, to each his own. I just don't like ho-hum faux brownie tainted treats. How about this - it tastes cheap and not like some fancy brownie dessert that you can get at the end of your restaurant meal, which is what I really wanted. I enjoy your reviews, but why do you leave capitals off new paragraphs? It just seems random and distracting. ahhhhhhhhhhh, sorry, this is one of my "quick" reviews, basically I type while I eat so it's very informal. on the contrary, i find that unless it's for something formal, all lowercase is much easier on the eyes. i am need my eyes to look at ice cream.